Nodes are found throughout the world and can be harvested for crafting. They come in several forms, including plants, ore veins, logs, and runestones. All nodes scale to either the level of your crafting passives, or your character level. Before Update 12, some zones had static or partially-static node tiers instead, corresponding to the level of the content. The above table also applies to enemies that drop leather (i.e. medium armor clothing materials). Plants yield reagents for Alchemy, raw materials such as jute for the clothing profession, and bait for fishing. Ore veins are distinguishable from regular rocks by virtue of their shape, size and color. The first type encountered in early levels is iron. Ores can be refined for blacksmithing. Logs can be harvested for wood used in the woodworking skill. The first type encountered is maple. Ore Seams can be harvested for metal dust used in the Jewelry Crafting Skill. The first type encountered is pewter. Runestones are for enchanting. Small shrine-like objects scattered around the world can be activated to yield a number of runes. Before Update 10, there were red, yellow and blue runestones which yielded a single rune of a specific type. Other gathering nodes include pure water and water skins, which may be harvested for solvents, and furrier's traps (found only at Clothing Survey sites), which can be harvested for medium armor materials. As the Clockwork City zone does not have any natural flora, Alchemy, Clothing and Woodworking materials are salvaged from various artificial nodes instead. There are two types of abilities that help with gathering. Both are passive. Keen Eye abilities make materials easier to spot out in the world. There is a Keen Eye ability for every profession except Provisioning. 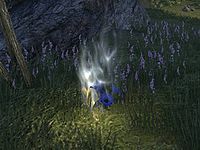 Hireling abilities make a hireling go out and gather materials for you once a day (or twice with enough skill points invested). Alchemists have no such hireling. This page was last modified on 14 June 2018, at 15:18.